If you are a teacher, you'll see your class(es) listed on the left under GROUPS. Use 'My Network' to edit and manage your class or group. Use your left navigation pane to filter on the group you want to manage. Click here to edit the name of your group or delete the group(for members). Note, that you'll only see the pencil option if you're the owner (main teacher/admin) of the group. Click here to transfer ownership of your group to another Livingtree contact. This will move the entire group (members, posts, events, etc.) to the new owner. You will still be connected as a co-admin, but, you'll be able to remove yourself from the group after ownership is transferred to the new owner. You can also click here to download a zipped file of the photos shared with the group since its creation. The file will be delivered to you via email. To invite other admins into your group, click here. This is a great way to invite team teachers. Co-admin will be able to share with your group and edit/remove content and parents as needed. 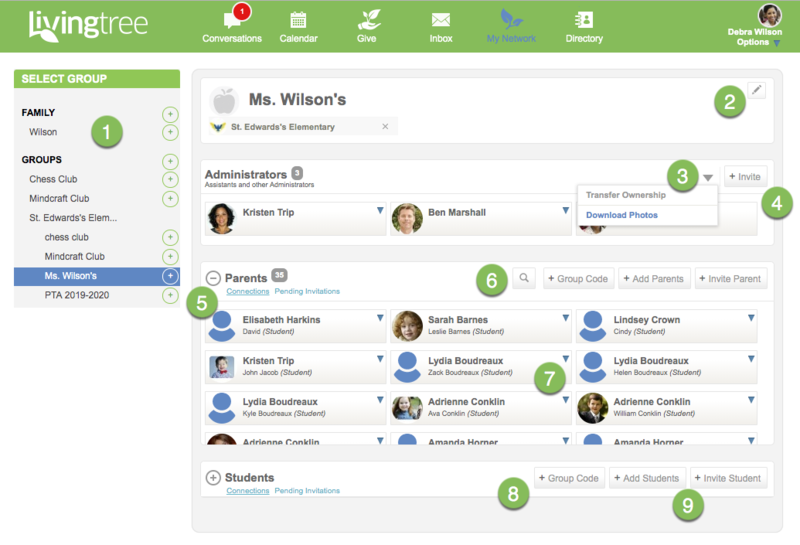 Click the '+' to view the parents connected to your group. Use the search button to pull up a certain parent by the parent or student's name. To invite a new parent or student, click on the '+ Group Code' or '+ Invite' buttons to invite using group code or email. Select the '+ Add Parents' or '+ Add Students' button to find and connect parents or students who are already connected to the school. Once added, the parent/student will be connected to your group immediately.